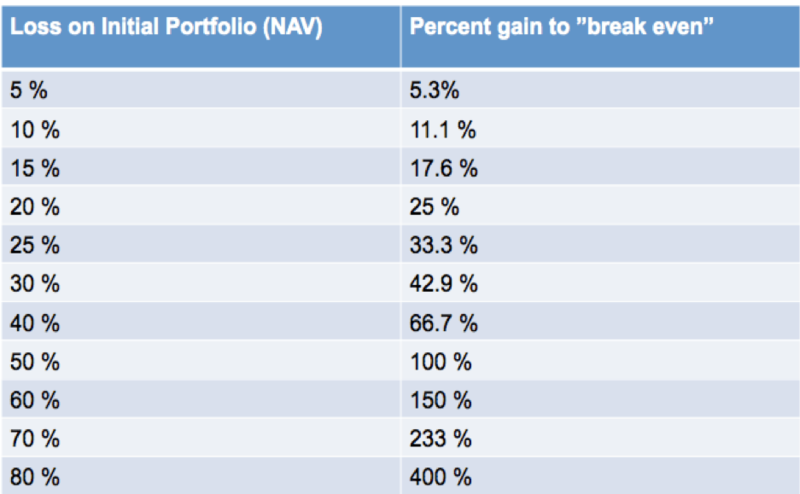 The below table is self-explanatory and takes us back to the argument of limiting the downside to our portfolio. 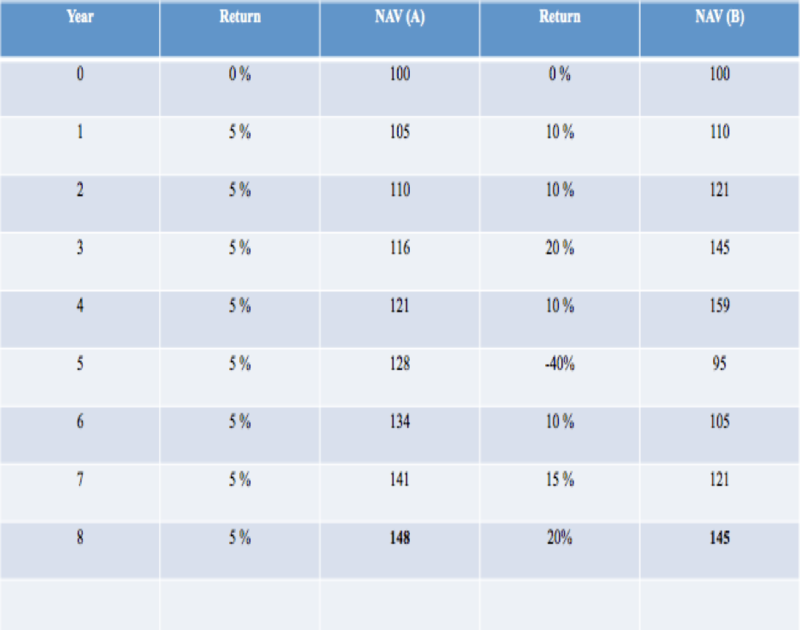 You must have the relevant tools in place in order to manage risk and p/l of your portfolio because volatility is risk! Risk management is a vital part of successful trading! Most people realize this but very few understand what risk is, nor do they have the tools to properly manage the risk in their portfolio. You will read about stop losses and other risk management tools on sites written by so-called traders that actually lack a proper understanding of risk and p/l management. A trader produces only one thing, p/l. Therefore it is vital to manage and optimize the p/l. 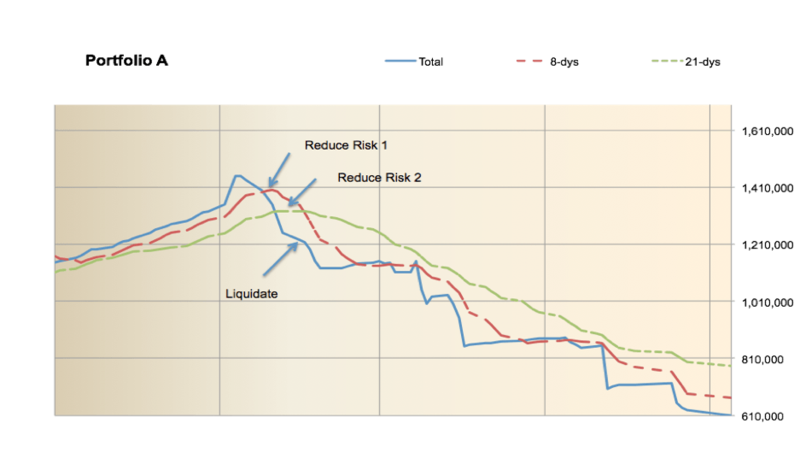 While most risk management systems focus on the risk via various formulas, I believe, especially for relatively short-term trading, one should manage risk in relation to how the underlying p/l of the portfolio is developing. Over the years I have developed a risk and p/l methodology. It is a simple tool that objectively tells the trader when to decrease or increase the risk in your portfolio. We are all different types of humans and we trade all different strategies, so the p/l chart will look different for most traders. The pro with plotting the p/l is the fact it shows you clearly and objectively what is happening. Some traders will have smooth charts while others have more volatile charts. 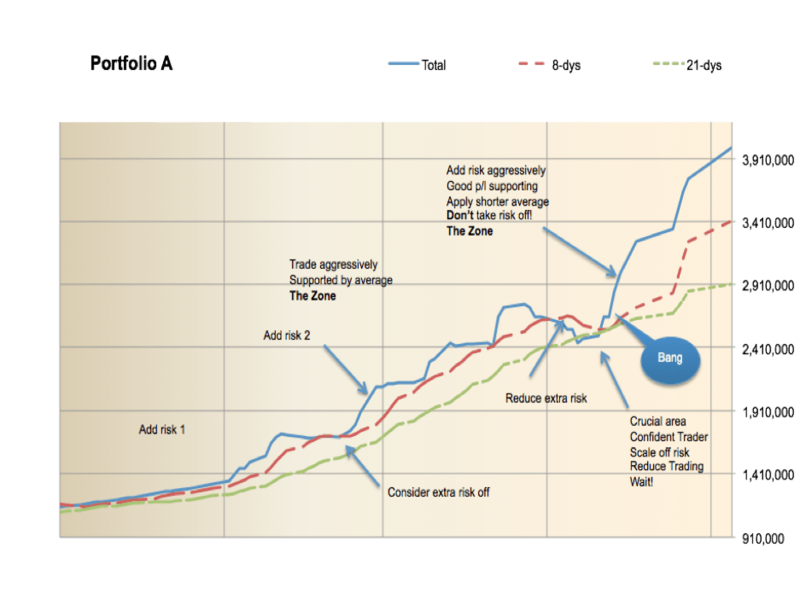 The basic concept is that the p/l chart shows how your trading is performing. In order to manage the p/l chart, we apply various moving averages. In the charts below we mainly work with the 21 and 8 day moving averages. A positively sloping moving average is telling you that your trading and strategy works well. A negatively sloping moving average is telling the trader the current strategy is not working well. The 21-day average is seen as a somewhat medium-term average while 8 and shorter averages are more aggressive averages to watch. The typical trader showing the below type of p/l is aware of his risk and usually trades constant risk with disciplined stop losses. The problem is that this type of trader doesn’t use the full potential in his/her ability. When the p/l slopes this smoothly, one needs to apply a more aggressive approach and take more risk since whatever you are doing is working well. You simply need to do it in more size! The chart below shows the bad trader. This is the trader usually making the first money by pure luck but lacks the understanding of why he even made the first profits. The successful part of trading usually turns when the trader enters a trade where the stock or entire strategy starts going against him/her. Many times these type of traders have very big egos and must be right. They see stop losses as personal failures and refuse to adjust to the thought of them being wrong. Any trader that lets the ego control the mind will end up in tricky situations as losses are a big part of trading. When the p/l starts dropping below the green line, the 21-day average, the bigger red alert flag starts flashing. There is still no panic and the trader MUST continue to trade but needs to have the discipline to reduce risk further. By now the objective observer clearly sees that the p/l simply isn’t working and that whatever the trader is doing simply doesn’t produce positive p/l. When looking at the p/l chart from start, the trader has still produced nice returns, but as we cross below the 21-day moving average, it is vital to have all tools and discipline in place to not give back more p/l than necessary. There is of course not one single trader nor strategy that always makes money, so it is important to take proactive action. As a general rule, the trader should reduce risk to 50% of normal risk usually traded as the p/l drops below the 21-day moving average. 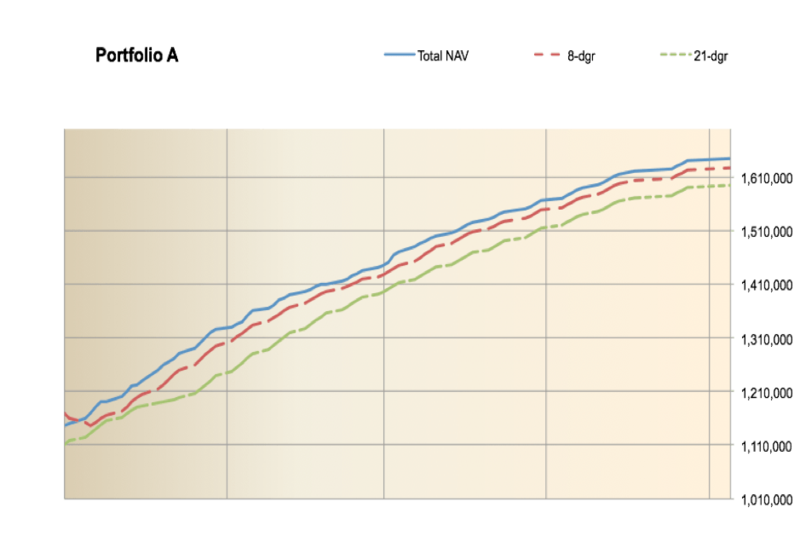 Looking at the chart below we see the p/l has moved from 1 510 000 to slightly above 1 400 000 as the p/l falls below the 21-day average. 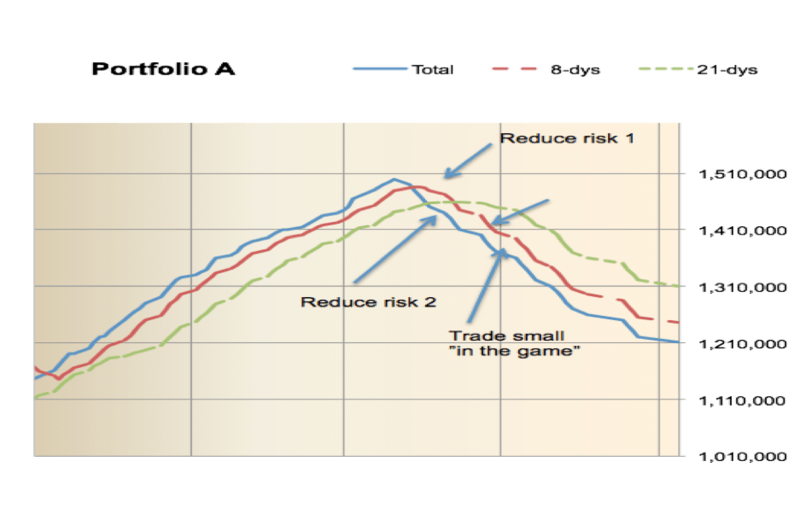 The aim is to continue trading but with reduced overall risk. Despite the reduction in risk the below trader’s p/l chart continues falling. A general rule is to start reducing risk further as the moving averages start crossing just below the 1 400 000 level. The strategy is obviously not working well at the moment but the aggregate p/l since the start of the chart is satisfactory and given the fact, the strategy currently doesn’t work the risk management focus needs to shift to defense and focus on limiting further downside. One negative effect, apart from the obvious, is the fact negative p/l periods often affect the trader negatively as self-esteem gets affected. It is important to not let the p/l develop into the chart below. The methodology will automatically reduce risk by 50% as the two moving averages cross (the trader needs to follow the methodology of course!). Should the p/l continue lower, risk needs to be cut further. Despite the reduced risk, the trader will continue to trade but with a strong focus on limiting further downside. In a scenario where the p/l falls below the 1 400,000 level risk needs to be reduced further and predetermined rules need to be implemented. It is advisable to set up rules where the trader in this period is allowed to lose only small amounts per day. One good rule is to switch off trading for the day if you lose approx 10% of a normal daily p/l swing. This will still keep the trader active trading but will make sure the p/l is not allowed to go much lower. This is the last phase of aggressive risk management. 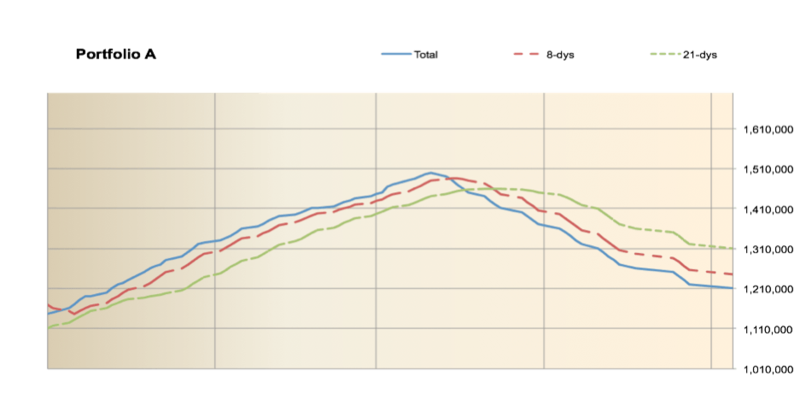 First risk reduction occurs when the p/l falls below the 8 day moving average (red line). The second risk reduction occurs when the p/l slips below the 21 day moving average (green line). Further reduction of risk occurs when the moving averages cross. At this stage, the trader should be trading a fraction of the normal risk, approx 25%. Should the p/l continue to be negative the trader needs to apply the last part of the risk reduction by applying a small max drawdown per day. If this max drawdown is hit during the day, the trader simply stops working that day. In case this max daily limit is hit for a period of one week, the trader must take time off. The chart shows how the first crossing of the 8 day moving average occurs fast and we can clearly see that the trader lacks methodology to reduce risk and slow down the negative p/l. In this example, the p/l drops abruptly below the 21-day average as well. We all know this seldom happens. Traders start doing the opposite, instead of cutting risk they many times start accumulating more of the positions producing negative p/l. The chart below explains in detail how a trader that is in the zone should behave. As long as the trader is above the 8 day average additional risk needs to be considered. This must be done automatically (ie no subjective thoughts that interrupt the process of risk taking) since the objective method is telling you to do so. Of course one needs to be aware of and manage possible downside, but risk must be added irrespective of the trader’s view or feelings or other subjective aspects. In periods of very good p/l I would consider adding a 5-day moving average even. This is rather aggressive but will keep you very aware of p/l and risk.